What is the meaning of the digestive fire Agni? Practitioners of Ayurveda connect the digestion with the Fire. It is one of the Five Elements of Creation in Cosmos and in their philosophy it expresses the passage of matter from one form to another. 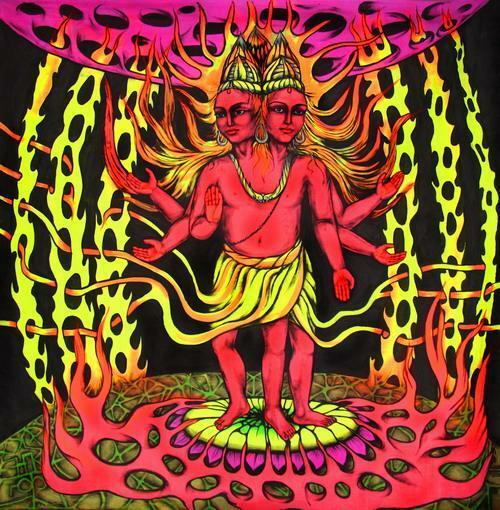 Its God is called Agni. From here Ayurveda speaks about the digestive fire Agni. It is meant that during digestion food passes from one state to another and in the body there is a metabolism /transformation of the matter in different forms/. Practitioners of Ayurveda give great importance to the digestive fire Agni. It is as important as the food that is consumed and the way we eat, and for Ayurveda, these are at the basis of a person’s health. It is considered that if the digestive fire Agni is weak then the consumed food is not digested on time and undigested remains are kept for too long in the digestive system. When this happens different processes such as rotting and formation of toxins take course. Over time, they spread to the body forming a sticky substance like mucus. In addition to clogging the channels for absorption of the substances with free radicals, pesticides and heavy metals, Ama poisons organs and disturbs their basic functions. During these disease processes people often begin to gain weight. Therefore Ayurveda practitioners have a system of rules to maintain the digestive fire Agni. They are related to everyday practices. Often people make the mistake of drinking water when they are hungry. This usually happens when on a diet to lose weight; they think that this way they will beguile their hunger. With digestive fire Agni Ayurveda practitioners apply their principle that natural needs should not be suppressed. If you are hungry, then the body needs food. Drinking water in this case suppresses the natural need – gastric juices are diluted, the strength of the digestive fire Agni decreases unnaturally. It is also harmful for a person to disregard the cycle of “burning” of the digestive fire Agni. The main meal should be at lunch as this is when Agni is the strongest. For processing – mechanical and chemical, and the absorption of any food in the body it takes a certain amount of time. There are also different phases and treatment processes – mouth, esophagus, stomach, small intestine and colon. In this complex process, the body can absorb up to 90 percent of the food consumed. Digestion can take up to 72 hours or may be less than a day. Some types of food are digested faster e.g. fruit and vegetables. Some additional factors play a role in the digestion and absorption of substances – it is one thing for active athletes, and another for people with a very immobile lifestyle. The combinations and the sequence of food intake are also of great importance for good digestion in Ayurveda. Each food has different characteristics – such as taste, heats or cools, and consumed at the right time of day can stimulate digestion. Inappropriate combination, however, may make it difficult for the food to be fully digested and allow toxins to form in the body. Fruits, for example, widely used in Ayurveda, should not be eaten as main meals but as an intermediate meal, at least two hours before or after the main meal. It is best to eat fruit at 10 a.m. and at 3–4 p.m.
Also for the good digestion in Ayurveda one meal should not include different types of fruit. It’s best to eat fruit before noon and no later than 4 p.m. It’s allowed to have up to 3–4 vegetables with each meal. Honey, which is also very popular in Ayurveda, should not be heated because it becomes harmful and prevents the absorption of the substances because it starts to act as a glue – the cell membranes are clogged. The requirements for food for optimal digestion in Ayurveda are many. Everyone can get prescription from an Ayurvedic doctor for the exact combination of foods during the day according to their body type. For example, at the Ayurveda Clinic Bansko, where a skilled Indian Ayurveda team works. Ayurveda’s rules for maintaining optimal digestion and hence for good metabolism stem from two main points. The first is a consideration of the natural processes in the body. The second is Ayurveda’s universal principle of balance. For good digestion in Ayurveda, a person should to eat only when they are hungry. However, this is one of the most frequently violated rules in Bulgaria. We eat when we are worried, when we are nervous, “take a bite” while watching a tv show or a game of football, etc. Thus we “do not allow” our body to optimally absorb and exchange the substances. Because if we are not hungry but “take a bite”, then we are adding new food for digestion before the digestion of the previous eating has been completed. This interrupts the absorption and supposes remains which form toxins. And toxins are the base of diseases. For good digestion in Ayurveda it is a strict rule that eating should not be done by the way – while we are walking down the street, in front of the computer while we are reading the newspaper, while we are driving. When we are eating, we must disregard everything else, be calm and focused on eating, and chew well. Thus, we will realize, in a timely manner, when we’ve had enough and avoid overeating, and it will be easier for us to keep the balance that Ayurveda has formulated. For optimal digestion in Ayurveda, it is believed that 25 percent of the stomach should be left empty, 25 percent should be liquid food, e.g. soup, and the remaining 50 percent should be solid food. The dishes themselves must include each of the six tastes because they all have a role in the full value digestion in Ayurveda. For example, spicy foods stimulate digestion and metabolism; tart foods decompose fat; sour foods have a cleansing effect and support the absorption of minerals, and so on. The six tastes – sweet, bitter, salty, sour, tart, spicy can be achieved with the help of condiments and not with types of food. For good digestion the food should be warm because cold food is digested harder. Food takes energy from the environment! 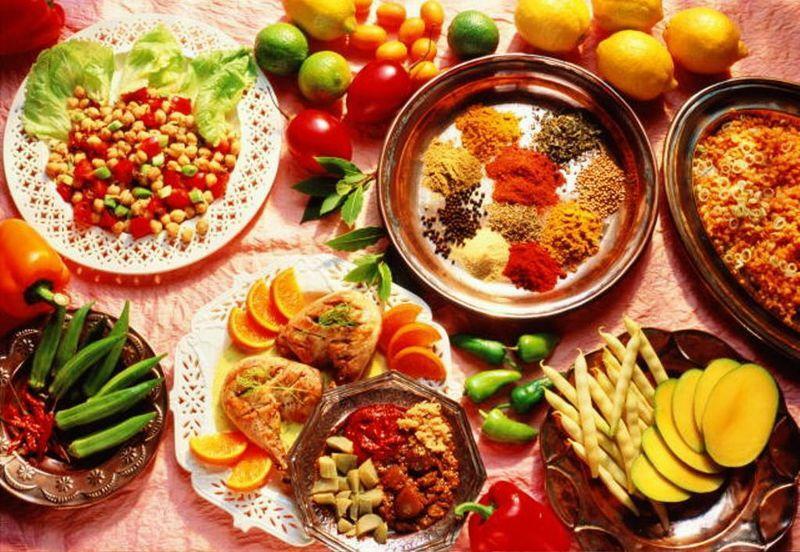 Ayurveda views food mostly as a source of vital energy for the body – its existence and development. This does not mean that gustatory qualities are neglected. On the contrary, it is a basic idea that the dishes should be delicious. Otherwise they do not benefit the body even if the products from which they were prepared were useful. 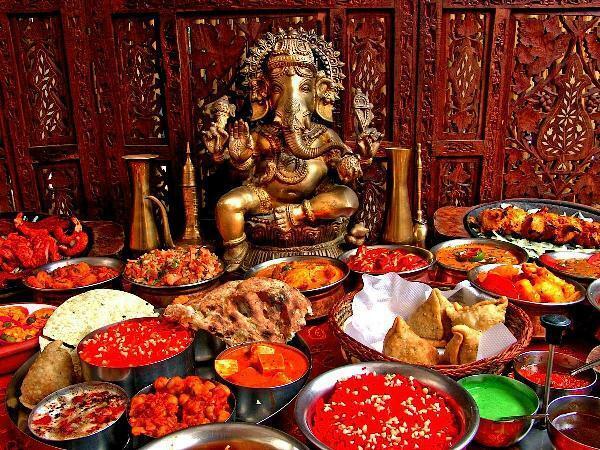 For Ayurveda, 40 percent of the energy required by the body is taken from food. The rest is taken from breathing, yoga and meditation. 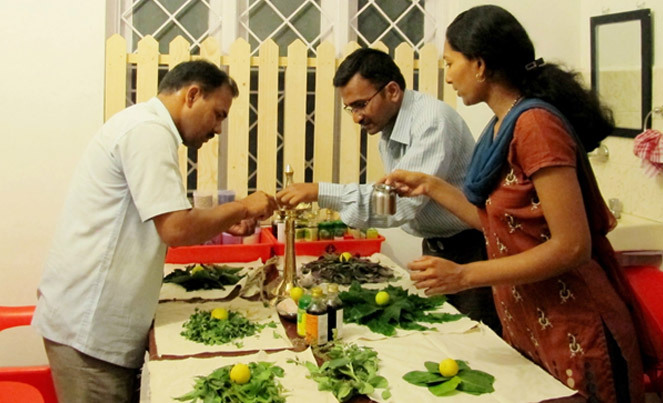 Ayurveda practitioners therefore pay particular attention to food. Food itself brings energy through the substances that the body absorbs from it. Products have taken this energy from the nature. The energy is as strong as the natural conditions in which the products were grown. The longer the products are conserved, the more their energy is reduced. Ways of processing are also important – they can conserve energy as much as possible and can greatly reduce it. For Ayurveda practitioners the canned and semi-finished products are dead food that does not have useful energy. Along with all of this, food can take energy from the surrounding environment. Therefore, besides the rules for optimal digestion in Ayurveda, there is also an orderly theory on how to prepare the dishes. Requirements apply for the premises where the food is prepared, for the people who prepare the dishes and for those who consume it. The premises should have lighted and clean not only because of hygiene but also in order not to have any bad energy in them. This is because the products will absorb it and transfer it to those who consume them. Thus, healthy food will become harmful. For the same reason the people who prepare and serve the food should do it with light emotions, with love. These requirements apply also to the person eating. Every negative emotion – anxiety, anger, anger, depressive thoughts, etc. during meals kills the energy of the food. Ayurveda’s basic understanding is that one must be in harmony with Nature and the Cosmos – they were created to exist under the same laws. From this principle of consonance with Nature comes the understanding of the cycles in the body. According to Ayurveda, there are three phases in human everyday life related to the Sun’s activity and change every 4 hours. Eating and the general routine should be in compliance with them. The first phase is from sunrise to 10 a.m. The body is not active, it’s relaxed and feels heavy. The digestive fire is not strong, breakfast should be up to 9 a.m. and be light – fruit, milk, honey, hot water. Between 10 a.m. and 2 p.m. the sun rises high, the body activates fire Agni at maximum; this time slot is for the main meal – vegetables, soup, cereals, etc. It is then that the body can take the heaviest type of food for the day. In the next 4 hours – until 6 p.m., the body is activated the most for work. The digestive fire has however gone weak same as the power of the Sun. The dinner should be at around 7 p.m. and be light – walnuts, fresh milk, lime honey. Thus changing the cycle of body activity over 4 hours continues in the same sequence. The time for socializing, reading and chores is until 10 p.m. Going to bed should not be after 10 p.m.; the main part of sleep is until 2 a.m. when the life forces are restored. Sleep, of course, goes on afterwards as the Ayurveda practitioners get up at sunrise for personal hygiene and spiritual activities. At 6 a.m. it’s time to start a new active day. Previous Post: What is Kama in Ayurveda?